But you said that Lord Mabreton is loyal to the Shield. Why place a spy on him? The Shield rejoices in Lord Mabreton’s loyalty, Your Highness. He rejoices in it so much that he never tires of receiving constant proof of it. 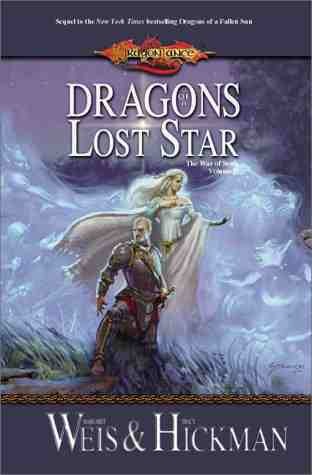 Weis and Hickman have put together a book very different than their usual fantasy fare. In fact, in some ways, they turn some of the general fantasy conventions into very different things. Imagine a land where dwarves are not the mountain people obsessed with gold, but as a race that plans to eventually rule the world (although they aren’t in any hurry) and travel as master horsemen. A land where orken are a race of highly superstitious sailors who respect strength as well as cunning. A land where elves are prolific breeders in spite of their long life-spans, who believe that even showing an emotion on their own faces would invade the life of another. Humanity, on the other hand, continues to be the mixed bag. This is the land of Loerem, and the setting of Well of Darkness. It also manages to be a little different in that in most fantasy books, the protagonists would be considered the villains. It matches up an unlikely duo. Young Gareth, cursed with a rather significant birthmark, enters into the royal household of King Tamaros as the whipping boy for Prince Dagnarus, the second son of the king. Dagnarus is…well, let’s just say that he’s not the nicest person around. Then again, perhaps it’s understandable-he’s the son of the king’s second wife, and the first son-Helmos-is everything a king would want in a son. While Tamaros doesn’t neglect Dagnarus, the boy nonetheless feels a great deal of jealousy and envy. Worse, he wants to be the king, which would require that Helmos be removed. The pot gets stirred when talk of war between races goes around the court. In an effort to unify all the races of the land peacefully, King Tamaros appeals to the gods, and their answer is the Sovereign Stone. The king gives a piece to a representative of each race, keeping one for humanity. In the process, however, he inadvertently reveals a dark aspect to the gift of the gods to the last person he’d want to learn it. And that drives the remainder of the book. Well of Darkness has some of the classic trappings of fantasy, in spite of turning things on their head a bit. There’s jealous rivalries, there are champions of good and evil (that’s really evil), there’s doomed romances, and terrible sacrifices. There’s some interesting characters as well-the elf Silwyth, who’s a nasty piece of work, as well as Dunner, one of the dwarven Unhorsed-a dwarf crippled and so is looked upon with nothing but pity amongst his race. Helmos and Tamaros are, perhaps, too good for the world, as they have the noblest of intentions. We get some neat concepts thrown in, too. The Portals that allow the races to actually perform trade with each other even though thousands of miles separate them. The Dominion Lords, champions of the gods, and the Transfiguration they must undergo after a series of tests. And the Vrykyl, who are really nasty, created as the dark side of the Dominion Lords. And best of all, gods who try very hard not to meddle-who indeed see the races as children who have yet to learn not to play with dangerous toys. Really, though, the stars of the book are Dagnarus and Gareth. Dagnarus is the big mover in the story, as his desires are what drives the plot along. Gareth is his willing ally, even though he was originally brought in to serve as a living lesson for the prince. The two work together over the years to become…. Well, I can’t really give everything away, now, can I? This book sets the tone neatly for the next book in the Sovereign Stone trilogy, while remaining a fairly self-contained story all by itself, which is one of the reasons I liked it. I’m a big fan of books that end a story, even though there are remaining questions to be answered. In that, Well of Darkness succeeds admirably. Don’t you see, Galen? You can’t go home. This is who you are. You’re trying to run away from yourself-from who you really are. No man can run that fast or that far. I was uncertain about picking up this book. 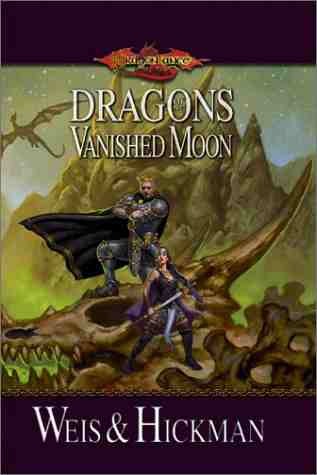 The truth is, while I love Tracy Hickman’s work in collaboration with Margaret Weis (especially for the Dragonlance and Death Gate books), I wasn’t enthused by the one solo offering of his that I had read. 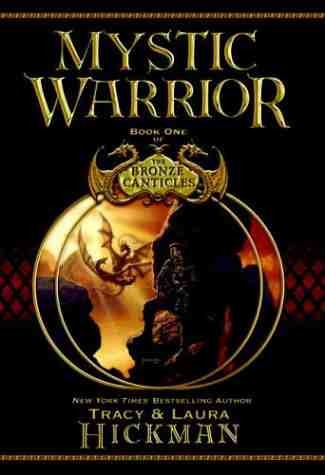 On the other hand, I figured that perhaps that work was an aberration-so I picked up Mystic Warrior, the first in the Bronze Canticles series. Just goes to show that it’s often a good idea to give someone another chance. The setting of the Bronze Canticles is actually a trio of settings-three worlds that are seemingly separate, yet in a strange way connected. One world, Aerbon, is populated by dwarves and humans who live at the whims of five mighty dragons. The world of Sine’shai is inhabited by faeries, at war with Famadorians-creatures such as centaurs, satyrs, and minotaurs-and with each other. And finally, there is G’tok, a world inhabited by goblins-and by the unmoving remains of great metallic Titans, as well as assorted mechanical devices that no longer seem to work. The connection between these worlds seem to focus through the dreams/visions of certain people in each world. In Sine’shai, the Fae Seeker named Dwynwyn is featured in the dreams. In G’tok, an “engineer” named Mimic seems to have had a vision or two of his own. And in Aerbon-well, it seems that a number of people have been afflicted by these dreams. One such is Galen Arvad, a blacksmith; not only does he have the dreams, he also has the dubious gift of hearing the conversation of inanimate objects. Unfortunately, this marks him as one of the Elect on this world-people who are taken away by the Inquisitors of the Pir Drakonis (“People of the Dragon”). Galen was able to avoid being discovered for a long time-but luck runs out sometime, and it happens early in the book. There’s a bit of time spent with the Fae in the book as well, and I have to say that I found it an interesting take on such beings. When reading about faeries, one tends to think of trickery, deception, and mostly frivolous; one doesn’t expect them to be at war with everyone-and I certainly didn’t expect to see that the Fae do not lie-period. Truth is very important to them, and the position of Seeker is dedicated to discovering new truths; such truths may even turn the tides of war. As far as the goblins…well, to be honest, while I hope to see a bit more of them, I was a little underwhelmed by Mimic and his work to move up the social ladder (thanks to his knack for getting a mechanical device to actually work). Still, we’re early in the series, and a lot can happen in future books. As far as magic goes: well, it’s interesting. It’s certainly different than your usual hocus-pocus, and it’s a little tricky to understand; fortunately, there’s an appendix that helps describe it, along with other major details about the setting. I found Mystic Warrior to be a fairly good read, and a great improvement over the last solo effort of his that I’d read (although I must give credit where credit is due: this book wasn’t a solo effort; Laura Hickman is the co-author, and I don’t want to miss acknowledging credit to her). While much was revealed about Aerbon in this book, there’s still mysteries to discover, and we haven’t really scratched the surface of G’tok, nor do we have anything remotely resembling resolution in Sine’shai-which means there’s plenty of room to explore in the next books. I’d say that this has the makings of a pretty good series. Don’t worry, Conundrum. I’ll fix everything. -Tasslehoff Burrfoot, not knowing that those are usually the last words that associates of kender ever hear. Dragons of a Lost Star kicks off with the leader of the Dark Knights of Neraka catching up on current events; and a lot is going on: the great dragon Beryl is attacking both the elven nation of Qualinesti and the Citadel of Light; and a thorn in his side, a mysterious young woman named Mina has brought down the magical shield protecting the elven nation of Silvanesti. Strangely enough, because of his rather delicate balancing act between Beryl and the dragons Malystryx and Khellendros, and the fact that he fears that Mina wants his job, none of this really comes as good news to him. At the Citadel, the priestess Goldmoon-mysteriously restored to youth, at least in body-follows dead souls to an uncertain destination. In Qualinesti, the Queen-Mother Laurana, King Gilthas, and Marshal Medan of the Dark Knights attempt to find a way to save as many elves as possible from the wrath of Beryl, and possibly find a way to do her in as well. In Silvanesti, the new King Silvanoshei deals with accepting the “friendly” invading army of Dark Knights led by Mina, with whom he has fallen in love. And Palin Majere and Tasslehoff Burrfoot, escaping the attack at the Citadel, find themselves in the presence of a dark wizard that neither has seen for a long time. There are subplots galore here as well. Gerard uth Mondar finds himself in a bit of a pickle when he tries to deliver to the Solamnic Knights a cry for help from Qualinesti…mostly because he returns with the appearance of a Dark Knight; he also runs into a very different kind of knight and is defended by the last person he wants to be associated with. Medan continues to act against the Dark Knights and Beryl, because of his love for Qualinesti and a certain elven woman, and prepares a last stand in the city of Qualinost. And the leader of the Dark Knights, Morham Targonne, has his confrontation with Mina at last. Mina remains the most fascinating character of this series, as she should be. I’ll freely admit that I was wrong about certain guesses I had about her (I was close, but “close” only counts in horseshoes, hand grenades, and thermonuclear weapons), but that’s my own problem…I’ll keep my day job…. Mina continues to be an extremely complicated woman, seemingly beneficent at some points, healing the sick and raising the dead; at other points, though, she’s coldly manipulative and treacherous. There’s a number of revelations in this book: Mina’s true nature, the truth behind the One God, the truth behind the great dragon overlords, and the fall of…well, let’s not ruin things too much, eh? Weis and Hickman never disappoint; Dragons of a Lost Star keeps the pace of the previous book, and the last eight pages of the book deliver a hell of a payoff! While I wasn’t sure if this was actually going to work as a trilogy for most of the book (there seemed a lot of things that still seemed hidden), that finale sets things up for a rousing conclusion for the next book…next year…! The Dragonlance books (at least as written by these authors) continue to deliver a good read to fantasy readers, with a combination of romance, treachery, adventure, and all-out war. Faithful readers of Dragonlance will enjoy this book, with both the standard humor and the bittersweet moments that are typical of the Dragonlance saga. I expect I’ll be gushing again once we hit the final installment. Your soul the night will keep. As far as novels go, this is a pretty significant one. This is the biggest Dragonlance book released to date; even the last Dragonlance hardcover is smaller. Still, this book needs all the space it can get; and even then, it’s only the first book in the new War of Souls trilogy. Some brief back story for folks unfamiliar with the world of Krynn-and its major continent, Ansalon. A few hundred years ago, the high priest of Paladine, the greatest god of good, attempted to wipe out all evil on Krynn, and beseeched the gods to help him do it; since the gods tend to prefer balance in the world, they were offended enough to remove their presence from the world (but not before chucking a fiery mountain at Ansalon to shut him up). For a long time, the continent fell into…well, not exactly savagery, but certainly not as well off as before. Then the gods came back-slowly, and it started with the Queen of Darkness, who woke up the dragons of myth, and set them to conquering the world for her. Heroes who would become the Heroes of the Lance rose against them, bringing back the good deities and dragons to fight them, and the Queen of Darkness was forced back (all this was chronicled in the original Dragonlance Chronicles). Things settled down for several years (not including a power-mad archmage who came within a heartbeat of destroying a god in order to become one-chronicled in Dragonlance Legends), before the Queen of Darkness attempted to use her enemies methods for her own; for example creating the Knights of Takhisis to fight against the Knights of Solamnia. Before things could really get going, though, the father of the gods was freed from a magical prison, and nearly destroyed Krynn in Chaos before being imprisoned again. With his imprisonment, though, the gods felt compelled to leave their world again, and took all the magic of the world with them…or so it was thought (this is chronicled in Dragons of Summer Flame, the previous hardcover mentioned). Since then, things have been kind of tough for Ansalon. Magic has been found to replace the magic lost, but not as strong or prevalent as it had been. The elves of Silvanesti isolated themselves behind a magical shield. The elves of Qualinesti submitted to a puppet rule by the son of two of the Heroes of the Lance, who was in truth under the forced command of the Knights of Takhisis. And new dragons showed up, grew much larger and more powerful than any dragon ever before, who decided that they were much better rulers than any puny mortals could be-and none of these dragons could be considered benevolent. Thus, all the races of Ansalon live under the sufferance of the dragons. 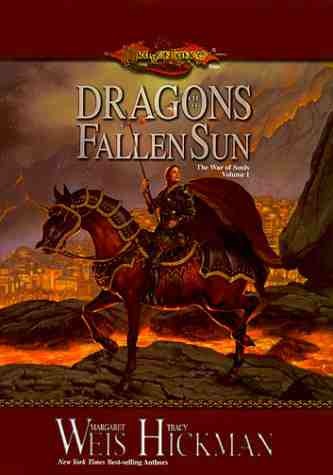 This is brings us to the new Dragonlance book, Dragons of a Fallen Sun. This book follows three major plotlines, although there are enough minor plotlines that will undoubtedly get bigger in the next book. All of these plots get kicked off, in one way or another, by one of the most massive storms that has ever struck Ansalon-a storm which seems to have no trouble hitting from one coast to the other. One of these follows the Silvanesti elf prince, Silvanoshei Caladon, son of the exiled elven rulers Porthios of Qualinesti and Alhana Starbreeze of Silvanesti. I call him a Silvanesti elf because that’s what his mother is trying to do-get through the shield around Silvanesti, and reclaim her heritage. Things go wrong during the storm, when a band of ogres attack, and Silvanoshei finds himself in a very unexpected predicament. The second plotline concerns the Solamnic Knight, Gerard uth Mondar, a guardian of the Tomb of Last Heroes, where the heroes of the war against Chaos have been laid to rest. His story gets kicked off when something inside the tomb decides it wants to get out. That extremely unexpected inhabitant-in combination with the death of a character longtime readers will probably anguished about-puts the Knight on a quest that will take him into the heart of Qualinesti, and the lands of one of the great dragons. The third plotline, however, is the most fascinating. For the night of the storm heralds the arrival of Mina, a young girl who professes to the the servant of the One True God. And apparently, this god hasn’t much use for scruples-the song quoted above should be a good idea to start with, and one of her earliest actions demonstrates a nature for treachery. Yet she possesses the abilities that have been lost since the gods departed-including miraculous healing. To be honest, Hickman and Weis have done a great job with Mina; she just reeks of messianic fervor, and is a mix of strange compassion to…well, evil isn’t really the word I’d want to use here, but it sure isn’t good. There are also hints (at least, I think they’re hints) of who Mina was before she took up the service of the One God; I’m not going to give out my guess on a review, however: first, I may be wrong (hey! It’s happened before! ), and second, I don’t want to spoil it if I’m right. If anyone wants to know my guess and reasons that badly, email me. It’s always good to see if anyone keeps track of this site, given how infrequently I update it! All this occurs while magic seems to be running out; the reasons for this only begin to come to light in this book (it is a trilogy, after all). Longtime readers of the Dragonlance saga will be pleased to see some characters again, some of whom are rather unexpected. In addition, there’s a significant number of supporting cast that are worth following. I don’t know what it says about me that I find myself liking two characters on the side of evil (although perhaps not as strongly as one might wish)-Galdar a maimed minotaur, who is one of the first who encounters Mina, and is given a gift that cements his loyalty to her. He seems like a pretty rational fellow for a minotaur, who have a bad reputation on Krynn. I don’t tend to like mindless characters, so he’s pretty refreshing. The other is Marshal Medan, a Knight of Takhisis who is the man behind the military forces in Qualinesti. Unlike most of the Dark Knights of this time, he has a code of honor as strong as any of the Solamnic knights, and he’s come to love the land of the elves. This makes for a rather interesting balancing act between keeping it under control with an iron fist, and protecting its people from the wrath of dragons. It’s a refreshing change to be reviewing the first book of a trilogy for a change, and even better to give this a high recommendation to any fantasy reader. There’s enough background information that won’t scare away new readers, and enough plot and story to satisfy continuing readers. I’ll admit that I’ve only really considered the Hickman and Weis books to be the best of Dragonlance, and they continue to amaze. The only thing I really hated is the realization that I’ll probably have to wait a year before the next book comes out!! I’ll be first in line when the next one is released, though.